Thomas, Clarence. (2012). In K. Jost, American government A to Z: the Supreme Court A to Z. (5th ed.). [Online]. Washington: CQ Press. Available from: https://search.credoreference.com/content/topic/thomas_clarence_1948 [Accessed 25 April 2019]. "Thomas, Clarence." American Government A to Z: The Supreme Court A to Z, Kenneth Jost, CQ Press, 5th edition, 2012. Credo Reference, https://search.credoreference.com/content/topic/thomas_clarence_1948. Accessed 25 Apr. 2019. Charges of sexual harassment made the 1991 confirmation hearing for Supreme Court nominee Clarence Thomas (1948—), a prominent black conservative, one of the most tumultuous in the nation's history. When the Senate finally confirmed Thomas as the second African American to serve on the Court, the vote was the closest in more than a century. Thomas then staked out a position at the conservative end of the Court's ideological spectrum, calling at times for scrapping well-established, liberal precedents in areas such as civil rights, federalism, and individual rights. Thomas grew up in poverty in rural Georgia. After his parents split up, he was raised by his grandparents. His early education came in segregated Georgia schools run by white nuns, and he graduated from a Catholic boarding school outside Savannah. Thomas worked his way through college and received his law degree from Yale Law School. During President Ronald Reagan's administration, Thomas served as head of the Civil Rights Division in the Department of Education and then as director of the Equal Employment Opportunity Commission (EEOC). While at the EEOC, Thomas strongly opposed affirmative action programs. 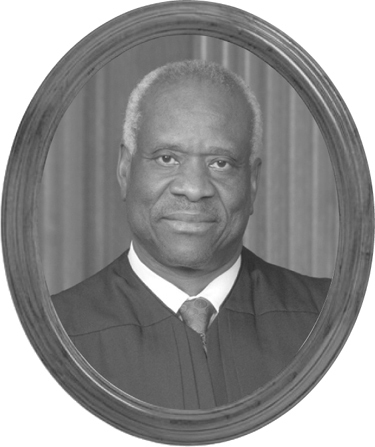 In 1990 President George H. W. Bush appointed Thomas to the U.S. Court of Appeals for the District of Columbia Circuit. Sixteen months later, on July 1, 1991, Bush nominated Thomas to succeed Justice Thurgood Marshall, the first African American to serve on the Court. During his confirmation hearing Thomas sidestepped senators' questions about his personal views, in particular on the abortion issue. Civil rights and women's groups strongly opposed the nomination. The Senate Judiciary Committee deadlocked, 7-7, on whether to confirm Thomas and then decided with only one dissenting vote to send his name to the full Senate without a recommendation. The committee closed the hearing without resolving the conflict. After a contentious debate, the Senate voted to confirm Thomas, 52-48. The vote was largely along party lines: forty-one Republicans and eleven Democrats, primarily southerners, voted for Thomas; forty-six Democrats and two Republicans voted against him. Thomas has voted with the Court's conservative bloc throughout his tenure but has been assigned relatively few majority opinions of major significance. Among his few major opinions were a 1997 decision upholding state laws for confining “sexual predators” in mental institutions, a 2002 ruling allowing random drug testing for any high school students participating in extracurricular activities, and a 2009 decision raising the burden of proof in federal age discrimination cases. Thomas has also called for overturning precedents expanding Congress's power in interstate commerce and allowing inmates to sue over prison conditions. He advocated changing the Court's doctrines to give greater protection to commercial speech and to make it harder to regulate campaign contributions. He also uniformly rejected pleas to set aside death penalty convictions or sentences and strongly backed law enforcement in criminal law issues. Thomas was the lone justice in 2004 to support the George W. Bush administration's claimed power to detain a U.S. citizen as a suspected terrorist without any hearing. When the Court struck down a ban on violent video games for minors in 2011, Thomas argued in a lone dissent that the First Amendment as originally understood gave minors no free speech rights except through their parents. Copyright © 2012 by CQ Press, an Imprint of SAGE Publications, Inc.